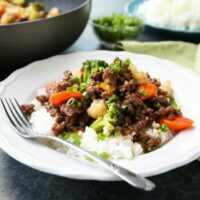 (Cheap) Korean Beef with Vegetables (+ Video) - Dessert Now, Dinner Later! 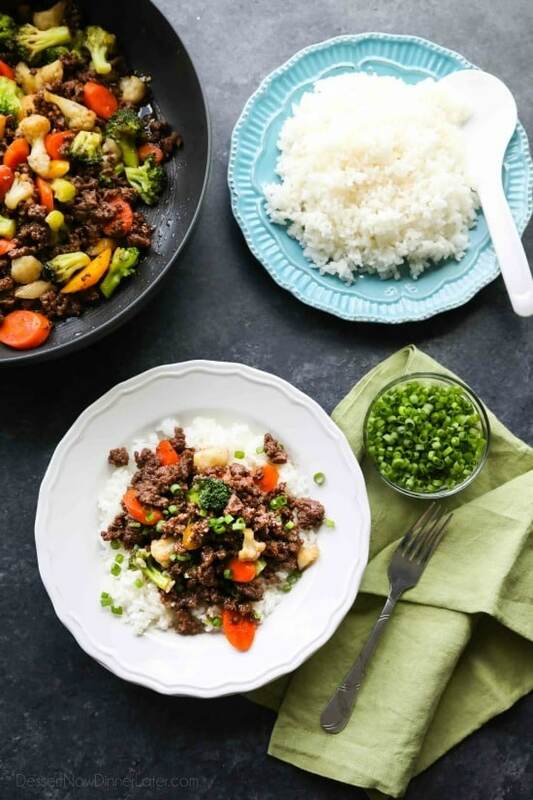 This cheap and easy Korean Beef recipe is made with ground beef instead of flank steak. 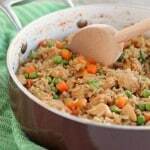 It’s simmered in a simple, yet flavorful sauce with added vegetables for a well-rounded meal. Serve with rice, and you’ve got a delicious dinner ready in 20 minutes or less! (*Update 8/23/17: New pictures and a video!) 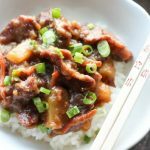 This Korean Beef recipe is a keeper! We’ve made it dozens and dozens of times since I first published this post on December 2nd, 2011. The recipe is so easy, so cheap, and has LOADS of flavor! 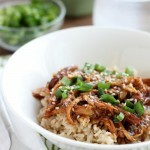 It feels like take-out, but is made quick and easy at home! We love the addition of fresh steamed vegetables to make it a more well-rounded meal. I could meal prep this and eat it the whole week long. I love it so much! The best part about this Korean beef is how quick it comes together. 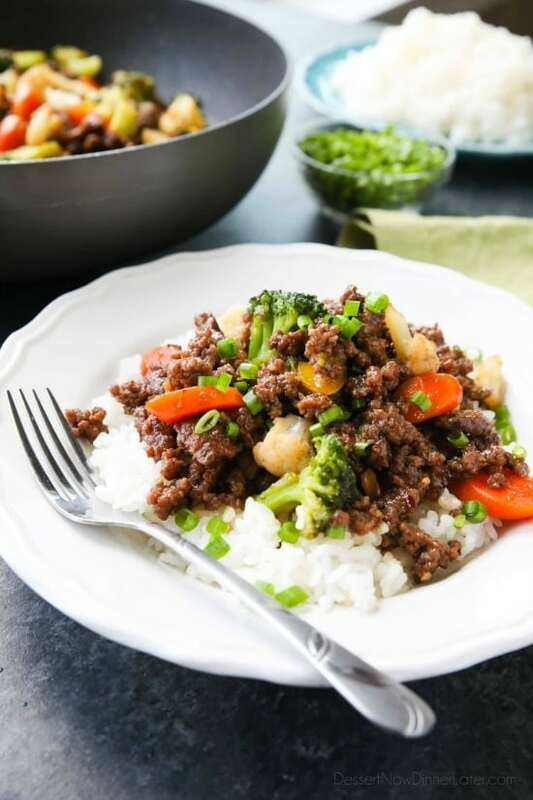 If you use pre-minced garlic, ginger paste, and instant rice, this meal is a cinch to pull off in 20 minutes or less. It’s one meal I have completely memorized and don’t even measure ingredients for. Definitely a family favorite! I hope you love it too! Steam/cook vegetables according to package directions. (About 8 minutes in the microwave.) Keep warm. Heat sesame oil in a large skillet. Add garlic and ground beef. Cook until brown. Drain grease. Return beef back into the skillet. Add the brown sugar, soy sauce, ginger, crushed red pepper, and cornstarch. Stir until sauce simmers and thickens; about 1 to 2 minutes. Add steamed vegetables and mix with beef. *Update 8/4/2013: My family has this meal quite frequently. We enjoy ours with extra sauce and some vegetables which kind of stretches the dish from the original recipe. We still gobble it all up, but it’s more of a well-rounded meal this way, so I’ve updated the recipe with our alterations. Hey Amber, I tried this recipe out tonight. I was so excited to make something a little different. It was delicious, I am definitely making it again. I probably should have taken your warning about the spice a little more serious. I added just a tiny bit more than what you suggested and I was feeling the pain, I guess I am whimp too when it come to spiceness. I just made this for dinner tonight. It was a hit! 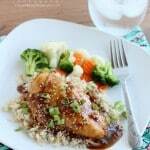 I used 1/2 cup of brown sugar and added 2T extra soy sauce. I also sliced up the white/light green part of the green onion and cooked it with the beef and garlic. If I added the greens to the top my kids wouldn’t eat, but if I cook it in the meat they don’t notice the difference LOL. Oh and I only used 1/4t red pepper and it was still too spicy for me 🙂 Thanks and I will be sharing this one. Nice way to sneak in those green onions 🙂 Glad you liked it! Thank you for this! It’s def. one of my fav go to recipes! My family will eats every last bit! OH I am so glad you like it! We make this frequently as well! Great! I only use low sodium soy sauce, but I am glad it was still good, even if it was salty. Do you think this dish would freeze nicely? The meat would be fine, but I wouldn’t re-freeze the frozen vegetables after they’re cooked, or the green onions. We totally had this for dinner again last night! It’s one of our favorites too! This dish is amazing and so quick and easy. Glad to hear it Tony! Bring back the old version of this recipe please. The old version of this recipe is very similar. What about the new recipe don’t you like? The only thing I added was vegetables, and corn starch. Do you think this recipe could work with white rice stick noodles? Sorry for my late response. I hope it worked out for you! I bet it would be delicious with the white rice stick noodles! Made this tonight…only thing I added was some Korean BBQ sauce. It was delicious. My whole family loved it and will go into regular rotation of meals. Awesome! Glad you are enjoying this recipe Sheri! I’m so glad I found this recipe! Loved it! I’m a vegan so I just substituted the meat for chopped mushrooms and I didn’t have sesame oil which probably tastes even better, but olive oil worked fine too. Threw some cilantro on top because, well it’s cilantro. Anyway, can’t wait to share with my vegan friends and nonvegan family. Thanks! That’s great! Thanks for sharing your alterations! Tried this recipe tonight and it was a hit! What is the nutritional value for this meal? Glad you liked it! I use MyFitnessPal to calculate recipes. 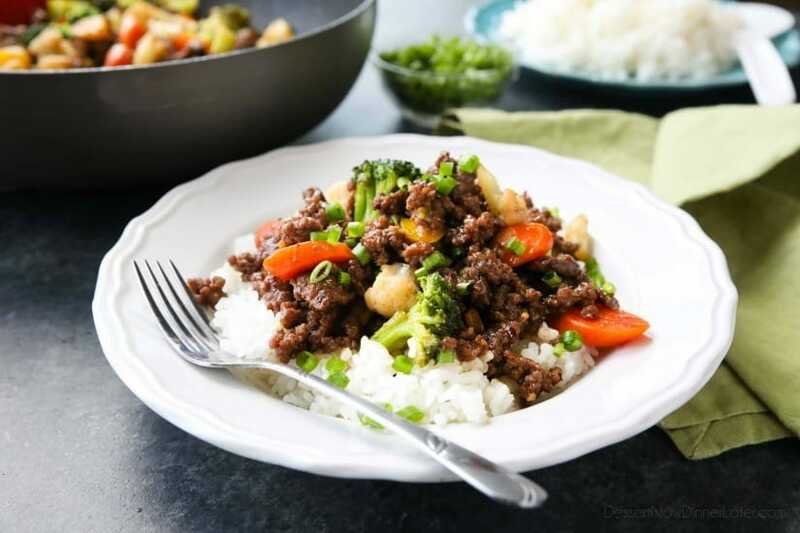 Depending on the products you use, this recipe is roughly 412 calories per serving (6.8g carbs, 19.5g fat, 49.3g protein) This recipe yields 4 servings.